2013 B Kosuge Pinot Noir The Shop: Retail $40. Another note that I wrote previously, but still holds true: “OK. Let me start with this: I consider Byron Kosuge a friend of mine. Not the kind of friend that comes over to watch the kids when my wife and I go out to dinner, but the kind of friend that I will definitely call when I am out in his neck of the woods. I first met him tasting through his wines after he gave me a tour of the custom crush facility where he crafts his wine. This is one of my wife’s favorites for good reason: black cherry, raspberry, and just a touch of black pepper. On the palate? Yum (I hate that word, but it is a propos here): near perfect balance and just the right amount of ‘fun. '” Outstanding. 90-92 Points. 2002 Carmes de Rieussec: From 375. Retail $20 (375). 85% Sémillon, 10% Sauvignon Blanc, 5% Muscadelle. I had just returned from a week in Sauternes and I decided to pull this to try with my chicken/crème fraîche dish that I have prepared countless times. Normally, I serve a Chardonnay with the meal and Sauternes with the dessert, but here, the tides had clearly shifted. Nutty and sweet, with countless flavors, this is memorable. In a good way. A very, very good way. Outstanding. 90-92 Points. 2009 Clos Pepe Estate Chardonnay Barrel Fermented: Retail $35. Came home from France and found this in the fridge. Initially a bit to acidic and far too cold, but once it approached room temperature it began to sing. Golden in the glass with a closed nose of mostly vanilla bean. On the palate, subtle citrus and plenty of tartness, this took a while to become friendly. Once it did? Sure, it is “barrel fermented” but has plenty of minerality and verve with a lengthy finish. Outstanding. 89-91 Points. 2005 Cosentino Winery The Poet: Retail $65. 80% Cabernet Sauvignon, 12% Cabernet Franc, 8% Merlot. I wrote this a couple of years ago, and it still holds remarkably true: “I picked these up a few years ago for a whopping $20/bottle. At the time, I was a poor grad student, so the six bottles I bought put a serious dent in the monthly budget. Tasting this now? Blackberry, blueberry pie. That means vanilla and even a bit of crème de cassis. I have waxed endlessly about how Cosentino was my gateway into the world of California wine so I won’t get into that again, but this wine really takes me back. The wine is likely at it peak as the tannins are nearly fully integrated. I should have doubled down on the ramen noodles and gone all in with this wine, buying all I could find.” Outstanding. 92-94 Points. 2002 Grgich Hills Cabernet Sauvignon: Retail $80. 93% Cabernet Sauvignon, 6% Merlot, 1% Cabernet Franc. I bought a couple of steaks and grabbed this from my cellar. I was not sure what to expect since the community at Cellar Tracker says that I should have consumed this bottle a full three years ago, by the end of 2014. Well, a funny thing happened on the way to this wine’s demise: it is fantastic, still. Raspberry pie on the nose with a bit of tar, and wonderfully balanced on the palate. The tannins are fully integrated and this wine is simply lovely. Outstanding. 92-94 Points. WINE OF THE WEEK: I had just returned from a trip to Bordeaux, focused on only the sweet wines from the region. I will be writing more about the specifics of that trip soon, but the basic premise of the trip was that sweet Bordeaux wines should be paired with all types of food, not just dessert. At the start of the week, I have to admit I was a skeptic; I love me some Sauternes, but putting aside the main course or even an appetizer seemed to be at best a stretch for me. Well, after just three short days in the region, I become sold on the idea; sweet wines can and should be paired with any variety of foods, from Asian dishes, to chicken and fish, and, I would contend, even pork and maybe red meat dishes. Thus, once I landed back in Houston, I was eager to apply my new-found conversion in my own kitchen. 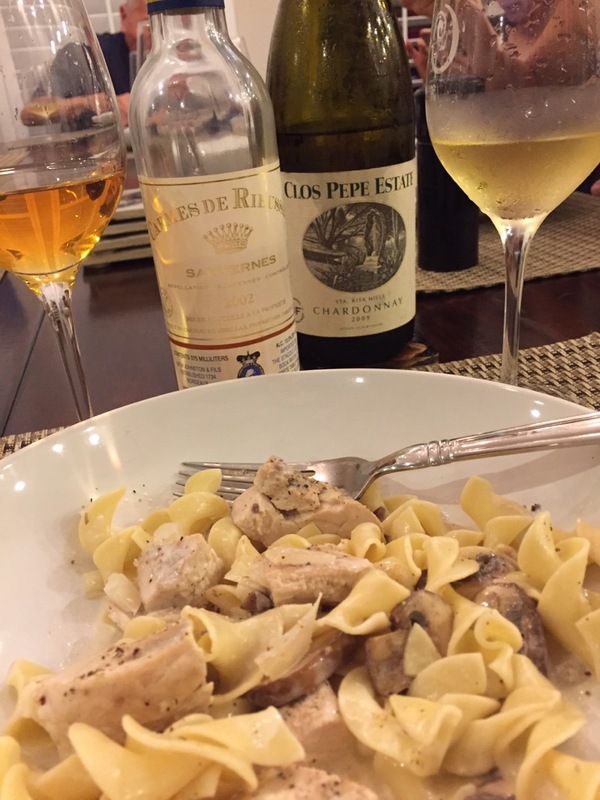 I decided to add a bit of a twist, though, as I also opened the Clos Pepe Chardonnay alongside the 2002 Carmes de Rieussec with one of our staples: Chicken with Mushrooms and Crème Fraîche. Normally, a wine like the Clos Pepe would have been my choice for the dish, but the Rieussec’s second wine more than held its own–it won the pairing. For that reason, it is my Wine of the Week. Looking forward to exploring the sweet wine angle more in the coming weeks. 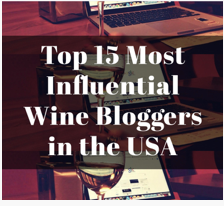 This entry was posted in Cabernet Franc, Cabernet Sauvignon, Chardonnay, Merlot, Muscadelle, Pinot Noir, Sauvignon Blanc, Semillon, Wine. Bookmark the permalink. My wine of the week was a ’99 Petaluma Coonawarra Red. After my tasting of the ’91 the previous weekend decided to try a bottle from my own cellar from the same winery, this is Cab Sav Merlot blend. Deep red in colour, starting show its maturity. Perfume of Blackberry, black pepper and spice, a bit mocha maybe as well. Lush, rich palate with velvety tannins and a lovely long finish. Amazing. Glad I have more…. Sounds luscious! Did you get them from the winery direct?